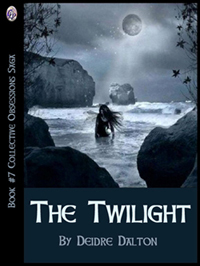 More than twenty years in the making, Collective Obsessions is a unique family saga set in the combined genres of mystery, the paranormal, historical romance, and dotted with a touch of the macabre and hints of classic Gothicism. The series chronicles the extraordinary loves and intricate obsessions between two families sweeping a span of more than one-hundred-forty years, all set against the backdrop of a Gothic seaside mansion in Maine. Forbidden love and dark secrets haunt two Irish families hacking out a new life in 19th-century America. When Molly Larkin's father discovers her affair with lighthouse keeper Colm Sullivan, his reaction pitches her into madness. Yet the legacy forges a bond of blood that will endure for generations. Fate continues to entangle the Larkin and Sullivan families amidst madness, murder and obsessive love. Colm and Molly's grandson Jean-Claude Sullivan finds his life driven by greed and perversely tainted pleasures. Beloved family chef Claude Mondoux watches helplessly as Colm slowly loses his mind in ghostly visions of Molly, while Colleen Larkin seeks love in the arms of another man with deadly consequences. An innocent meeting as children sparks a fateful yet perilous liaison between Shannon Larkin and Mike Sullivan. 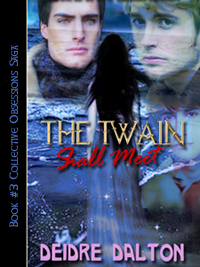 Will their romance follow the same tragic path forged by their mutual ancestors Colm and Molly? George Sullivan reunites with long-lost love Susan O'Reilly. Their daughter Carly enters into an unholy alliance to secure her position as Liam Larkin's wife. As secrets unfold and more madness takes root, Carly plots a twisted scheme to exact revenge on the Larkin family. 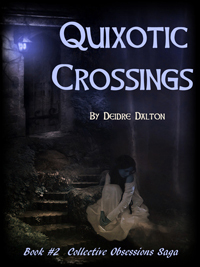 Shannon Larkin confronts demons from her past, while her daughter Angie discovers Colm Sullivan's old journal in the lighthouse keeper's cottage. 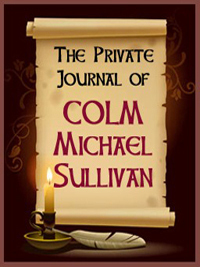 The diary sheds light on the history between the Larkin and Sullivan families, but may be too late to stop the sisters of Mike Sullivan from wreaking vengeance for sins and tragedies of the past. Shannon's son Jamie Page begins to understand his lifelong yearnings but fears his family will never accept them. His first love affair with a nefarious character nearly costs his life, but brings to light his hidden desires. Happiness continues to elude members of the Larkin and Sullivan families, as if a dark shadow of evil has settled over their lives. Shannon Larkin and Scott Page are happy in their long marriage, but a tragic loss forces her to delve into the past in order to face ugly truths about her husband. Devastated, she retreats into her own solitary world. 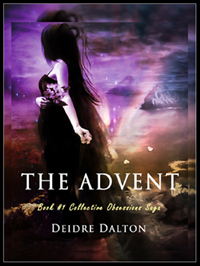 A stranger brings her out of self-imposed exile and proves the beauty of unconditional love exists after all. Megan Larkin falls for dashing Boston attorney Luke Castaneda, a newcomer to Larkin City. Locals try to warn Luke about Megan's family, their history of madness and tragedy, but he is determined to make her his wife. Other elements are at work to ensure the union never takes place, bringing another veil of evil over the Larkin's and their self-named city in the guise of a serial killer. 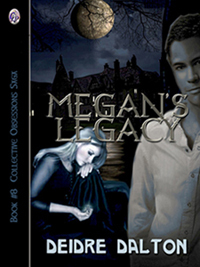 Megan is forced to discover the truth and to set herself free from a legacy of family secrets and obsessions. 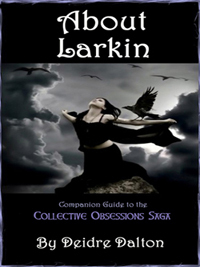 "About Larkin" is a companion guide to the Collective Obsessions Saga by Deidre Dalton. The guide offers insights into the story backdrop, such as particulars and images of Larkin City and the Larkin estate in Maine. Because the story spans more than 140 years, facts and entertaining trivia were compiled by the author during the writing process. Colm Sullivan's journey from Ireland to Maine begins the Collective Obsessions Saga. As the first lighthouse keeper at Banshee Point, Colm records his private musings, dreams and desires as he begins a new life on the Larkin estate. A number of fictional characters found in the Collective Obsessions Saga are exceptional cooks. 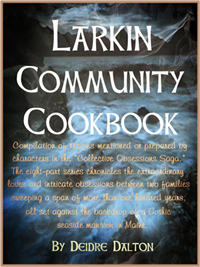 The Larkin Community Cookbook is a compilation of more than forty recipes mentioned or prepared by characters in the eight-part series.